"We are here to assist you in whatever your construction needs may be. If you have an idea that you need to see on paper, or have a plan that you would like to make a reality, we are here for you. Personalized service is our specialty!" Lotz Construction specializes in commercial and residential design, planning, and construction, farm construction, remodeling and restorations in Central Kentucky and surrounding areas. Eric Lotz, founder and owner of Lotz Construction is a high quality and attentive traditional construction manager who believes in maintaining good client relations. Lotz Construction provides quality customized construction projects with consideration to details. Eric Lotz is a licensed electrician, and has extensive experience in constructing horse barns, private residences, offices, warehouses, circular pole barns, run-in-sheds, workshops, garages, sunrooms, greenhouses, garden sheds, dog kennels, home and business additions, and structural modifications. 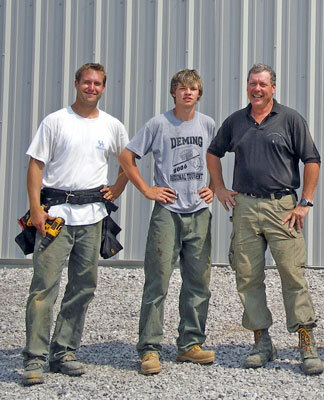 Lotz Construction provides estimates, design assistance, and personalized service. Contact Us Today for Design Assistance or a Free Estimate!